Bloat is life-threatening – I know first-hand because my first dog, a Great Dane we called Emily Sue, had bloat. Bloat has a mortality rate of about 50%. The first stage of bloat is characterized by gastric dilatation, in which the stomach becomes filled with fluid or gas and dilates or distends. The second stage is called gastric volvulus or torsion in which the enlarged stomach rotates or twists. This rotation blocks the entrance and exit from the stomach and prevents the release of its contents. The trapped contents of the stomach ferment and cause further distention. In this informative blog post from Dr. Peter Dobias, DVM, he discusses stomach bloat, its causes, and strategies for prevention. Please visit Dr. Dobias’ website to learn more about him at http://peterdobias.com/. You can also follow him on facebook here https://www.facebook.com/drpeterdobias. Recently I conducted a survey on the incidence of GDV in dogs. What I have learned is that dogs that are fed processed food are about five times as likely to suffer from a bloat than dogs that are fed raw or cooked food. Most veterinary textbooks state that gastric dilation volvulus is a serious life threatening condition which is caused by general breed predilection, fermentation and gas formation in the stomach and is often caused by stomach twist or torsion due to increased activity and exercise after eating. 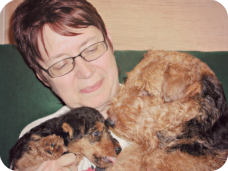 This is all true, however, when I started to observe the patterns and energy flow changes in the body of affected dogs, I discovered a few very interesting findings that can be used in GDV prevention and I would like to share them with you. The digestive tract of a canine evolved to digest the carcass of prey. Dogs have teeth that are used for ripping, shearing, crushing and crunching meat and bones. Dogs do not have grinding molars which are the hallmark of herbivores. Their digestive tract is ideal for digesting protein and also resisting bacteria due to the very, acidic pH of their stomach. When processed dog food is fed, it turns into porridge. The stomach doesn’t really kneed too much and over time, the stomach muscles become very weak in the same way as if you didn’t exercise. A weak stomach is much more prone to dilation in cases of fermentation and gas buildup happens much more often with purely digested carbohydrate foods. A strong stomach on the other hand would be able to expel fermentation gas much better because of its strong musculature which is also useful in twist prevention. Some people are surprised when they learn that fruit should never be fed together with the protein meal. The main reason is that fruit and protein digests very differently. Fruit digestion time in the stomach is relatively short and it will ferment and produce gas if it stays in the stomach longer. Some people even joke that the fermentation process causes alcohol production which can make your dog drunk. I have never seen this. If you feed a protein meal together with fruit, the digestion time of protein is longer and fruit fermentation is more likely to happen. That is why I recommend feeding fruit at least one hour or longer before a meal and at least four hours after eating. The general consensus is that dogs should not exercise after eating. This applies to either raw or processed food. When the stomach is full, it is more likely to flip and twist when there is a sudden movement, jump or turn. You should never exercise the dog vigorously within 3 to 4 hours after feeding. I have saved this topic for the end of the blog and it is my own take on GDV prevention. If you have read my other blogs, you may remember those where I talk about the energy flow along the spine. Some call it prana, Chi or energy meridians. I imagine this netrwork as the body’s “watering system” where the spine provides the main “water” supply and the branches lead to various “garden beds”, the body’s organs. You know that if you constrict a hose in your gardens watering system the carrots or lettuce will not thrive as well because of lack of water. Your dogs body is not much different in the way that if one of the branches of the spinal energy channel gets impinged or blocked, it will affect the organ that relates to that segment. These impingements or blocks can be recognized by a spinal exam or a hand scan where I notice changes in the energy flow. After years of observation, I started to see, which spinal segments relate to each other and the patterns present in a variety of different conditions and used the Chinese traditional medicine principles in creating a simpler, yet pretty accurate body map. While creating this map, I have found a very close connection between the stomach and spinal point at the thoracic lumbar junction; the transition between the last thoracic and the first lumbar vertebrae. 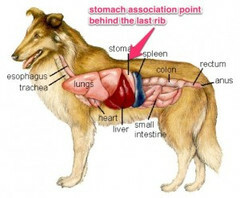 I have noticed that dogs that have a tendency to stomach problems are in general more prone to congestion, inflammation and sensitivity exactly at the T-L junction (thoracic-lumbar junction) – see the picture above at the beginning of this article. When I asked several emergency vets, they didn’t seem to be aware of this connection between this spinal segment and GDV. Then I asked if they saw any signs of vertebral degeneration, arthritis or spondylosis in this region when they took Xrays of bloated dogs. Indeed they confirmed that those changes are frequently present in dogs that get bloated. I saw this as another sign of energy flow reduction. That is why I urge you to pay attention to your dog’s spine. A regular monthly back care and assessment of any dog is one of the most important parts of disease and also GDV prevention. I find many modalities helpful – physiotherapy, chiropractic , massage or intramuscular needle stimulation treatment ( IMS) and acupuncture are good examples. I am not a huge fan of frequent ball throwing, sprinting, jumping up because. I’ve seen many dogs getting injured and their spine go out of alignment. My goal is to increase your awareness of this issue and I definitely will be writing more about it in future blogs. First I would like to say that simple panting is not a sign of a bloat. Panting is commonly the “canine way of sweating” and is considered normal in most cases when your dog looks otherwise comfortable. However if you see signs of severe distress, your dog’s gums are pale, he or she is salivating excessively and the stomach is distended, rush your dog to the nearest vet or emergency clinic immediately. If you have a 24 hour facility nearby, do not wait for a call back of your regular vet, just go if you can’t get hold of her or him right away. THIS IS A TRUE EMERGENCY!!! Most likely, a light sedation (of safe) and a stomach tube will be the first step or a possible gas pressure release by using a large needle in the stomach region of the abdomen. X-rays will follow and in some cases, an emergency surgery is the only option..
As a first aid measure on the way to the hospital, I recommend giving a homeopathic remedy – call Nux Vomica 200 C or Carbo Vegetalis 200 C.
Gastropexy is a commonly recommended preventive procedure where the stomach wall is attached to the inside of the rib cage to prevent the stomach from flipping. While this prevents gastric torsion, I am not that comfortable about attaching the stomach and restricting its natural movement and function. Any surgical intervention affects the body’s energy channels and the unnatural stapling of the stomach to the rib cage decreases its mobility. The best prevention of bloat is to follow the precautions of this article. In more than 15 years, I have seen only 2 bloat cases in my practice, which is way bellow average in dogs on processed foods. On the basis of my practical experience as well as the survey that I conducted recently, I believe that the best way of preventing GDV is to feed natural, non-processed food including raw bones, provide the right nutrients, feed fruit separately from the protein meals and ensure that the spinal energy flow is good. Reblogged with permission from Dr. Dobias.